Shake Shack's move to Los Angeles finally gives us a chance to pit the two burgers side-by-side. Who is the victor? 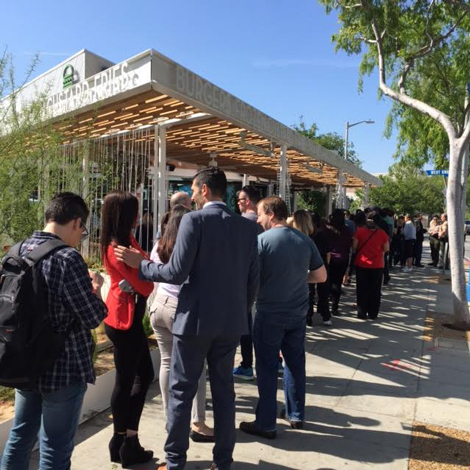 Yesterday morning, Angelenos were abruptly awakened from a reverie of Double Doubles by the encroachment of Danny Meyer’s first SoCal Shake Shack in West Hollywood, smack dab in the middle of In-N-Out territory. Shake Shack’s move to the West Coast was seen as risky by pundits who had been reared on Animal-style and long ago pledged their allegiance to the West Coast burger institution. But Meyer’s track record is undeniable, and the man with the Midas touch was not disappointed by the turnout thousands of miles away from Shake Shack’s New York headquarters. Even before the fanfare and ribbon-cutting ceremony, two people (Angelenos, not New Yorkers, mind you) had camped out at 4am to secure a spot in front. By the time I arrived at 11am, the line was wrapped around the block, with a wait-time of about one hour. Meyer was there himself, passing out high-fives, and based on their robustness, things were going according to plan. But even beyond that, for competitive bun-and-patty enthusiasts across the country, this was the excuse we had wanted all along—a rare opportunity to taste-test the two burger titans side-by-side without needing to overnight anything via UPS. (Sure, you can eat both in Vegas, but without the hometown pride, there seemed to be less at stake. Few would deny that no one puts their best foot forward in Vegas, anyway.) My plan was set—pick up both burgers and do the dirty deed. Admittedly, there was something unnatural about carrying a Shake Shack bag on La Cienaga Blvd, making me a prime target for the judgment of passersby. Little did they know that I was heading 10 minutes away to the In-N-Out next to Hollywood High to pick up a cheeseburger for a very important experiment. After acquiring both, I raced over to a deserted outdoor seating area at IHOP where I wouldn’t be bothered. 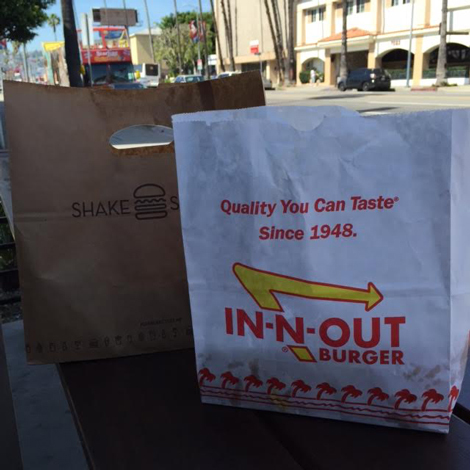 It was me, Shake Shack, and In-N-Out. The time had come to judge two burgers with a cult following on an even playing field. So help me God. 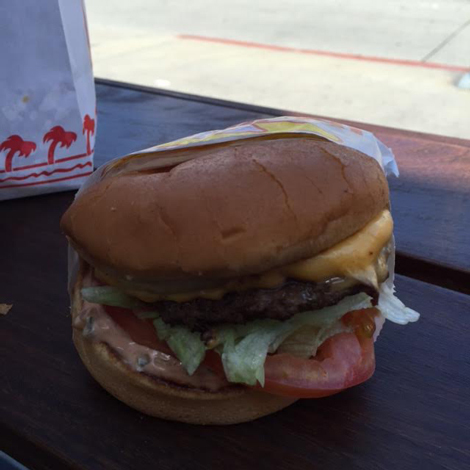 In-N-Out: The white squishy bun is a classic characteristic of SoCal burgers. It is unfussy, and unlike the ShackBurger’s, here it was perfectly toasted along the rim. Shake Shack: Martin’s Potato Rolls have become the go-to vehicle for any kind of sandwich in New York (see: Fuku, Superiority Burger). 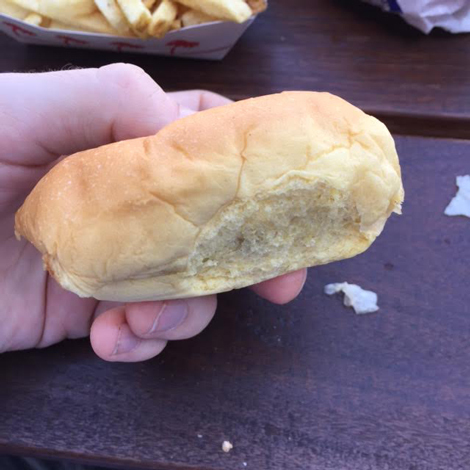 It’s a softer, chewier bun that I also find more buttery, and it’s substantial enough to absorb all the juices. That said, I also get overwhelmed by its richness in the context of a burger. One of the odd things about using Martin’s is that because they are not sliced all the way through, you end up eating a burger that resembles recalls the architecture of a pita pocket. In-N-Out: In my world, the only lettuce that adorns any burger is Iceberg, and the SoCal chain subscribes to this philosophy too. A perfect burger keeps in mind all textural counterpoints, including crunchy greens. Shake Shack: Aesthetically, green-leaf lettuce is a better look, but I didn’t taste or feel it in my mouth. In-N-Out: An In-N-Out burger is the sum of its parts, and the enjoyment of eating one involves the intermingling of cheese, beef, and special sauce. Narrowing in on the thin patty itself was a wake-up call that it takes a village. Shake Shack: The ShackBurger patty is at least a 1/2 inch thicker, making its presence more felt than its In-N-Out counterpart. It seemed to have a coarser grind and more “beefy” flavor profile, which might have to do with Shake Shack’s progressive sourcing methods. 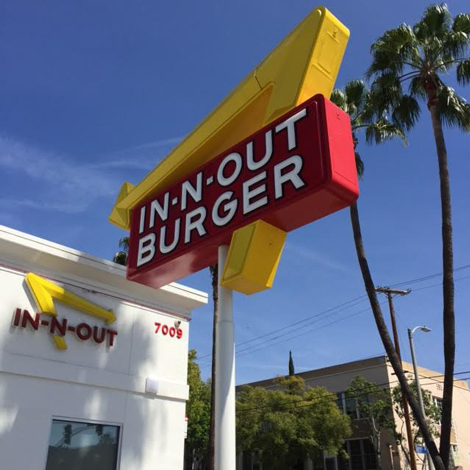 As we know, In-N-Out recently came under fire for serving beef with antibiotics, and the quality upgrade in this side-by-side comparison was apparent. 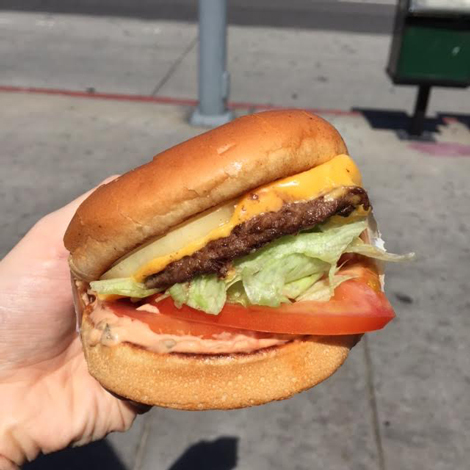 In-N-Out: Cheese distribution is key here, and extends over the entire patty, ensuring you get some in each bite. Shake Shack: It takes a bit of searching, potentially a problem resulting from patty overhang. In-N-Out: You don’t need me to tell you that In-N-Out fries are an abomination. They’re uninspired, soft. If they’re cutting fresh potatoes, why do they always taste like they’re a day old? Shake Shack: The crinkle-cut optimizes its crunchy texture. They’re salted aggressively and are fluffy on the inside. They are perfect. Let’s address the problems first. In-N-Out’s bun turned soggy in a very short amount of time, and stacked up to a Martin’s roll, the experience feels plain. 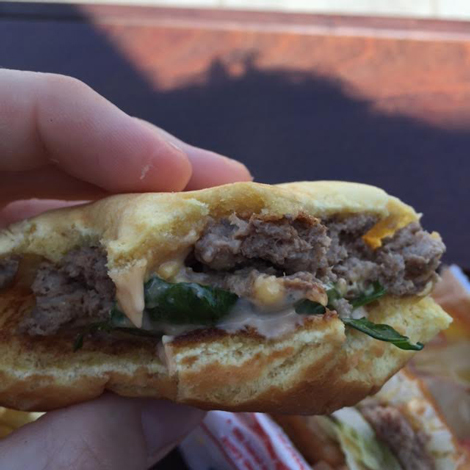 In-N-Out’s patty is more susceptible to getting lost in the burger itself. It has a shorter shelf-life, and should be shoveled into your mouth and eaten quickly. Which brings me to another point—Shake Shack feels more like a sit-down burger with its own unique set of flaws. (Meyer has refused to entertain the idea of drive-thru.) Picking up the burger can be awkward. The shape of the Martin’s roll means there’s a pretty significant overhang, a dilemma you’ll also encounter at Chang’s Fuku. The lettuce on the ShackBurger is a non-factor, and the cheese distribution seems to be an after-thought. There’s also something to be said about the richness of a ShackBurger—the buttery quality I mentioned up above can leave me feeling sluggish in a way that doesn’t happen with an In-N-Out burger. If I were to make a habit of going to Shake Shack, I’d probably be ordering the ChickenShack most of the time, which I think is the best item on the menu. That’s a bonus, but we’re here to talk about beef and cheese. 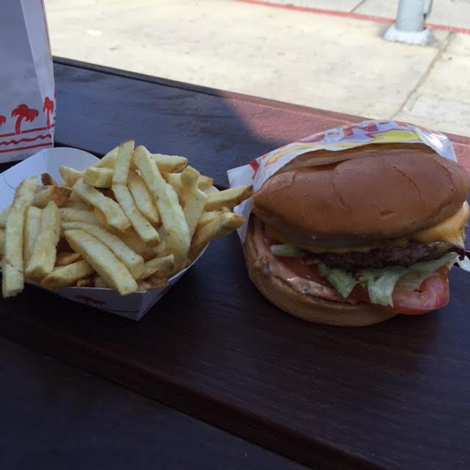 By price point, you can’t find a better burger in the city than In-N-Out. At $5.29, the ShackBurger enters a much more competitive field that includes Belcampo’s highly praised Fastburger, which features some of the best beef available in the country. People will certainly flock to ShakeShack and enjoy the burger, as did I. But it will ultimately fill a different need for diners than In-N-Out will. When I need a burger at last second’s notice, late at night, when it’d be shameful for me to show my face in public, I can rely on In-N-Out. It speaks a language all Angelenos are familiar with. I’m glad Shake Shack has joined the fold, but all hail the king.